Digital Marketing - SEO, SMO, PPC, Graphics Designing: Will Traditional Marketing is going to completely diminish in the upcoming years? Will Traditional Marketing is going to completely diminish in the upcoming years? 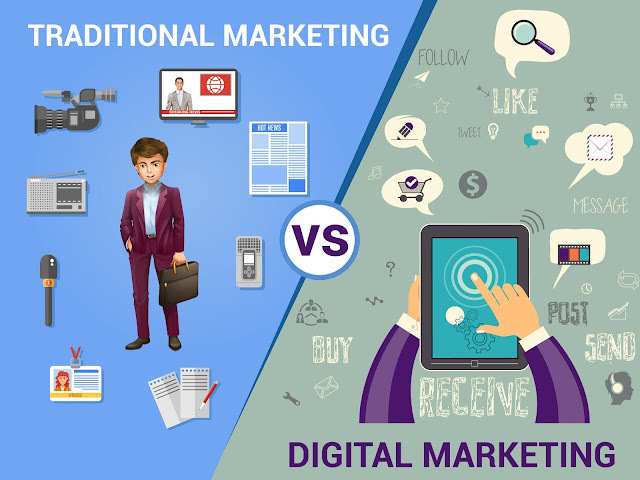 We are all aware that, "traditional marketing and advertising are now extremely old and digital marketing is the new thing in this growing digital world". Both traditional, as well as digital marketing, plays a vital role in a marketing strategy. The size of the company doesn’t influence any decision when it comes to market something because marketers have to think out of the box and be different from others to make it a success. We all are well aware of the future of technology and the virtual world, which why it is believed that digital marketing will take a little step over the traditional methods eventually. Traditional marketing has been around for a very long time now like TV, Magazines, Newspaper Ads, Radio, and Direct Mail. We have been familiar with traditional marketing methods as they're easy to understand and have been used for decades. Many companies continue to include traditional marketing as part of their budgets. The reason behind which is that a single ad can reach thousands if not millions of viewers in a short period of time. This can work if a company's target market is wide and they also use deep marketing budgets. While traditional marketing has value, it is slightly slower paced and limits a company's ability to efficiently grow as quickly as it could be using more digital marketing. Digital marketing companies can hyper-target customers in a most relevant manner according to their products and services. For example, an IT consulting company can hyper-target their marketing only to senior executives of healthcare companies in the area with 100-500 employees, annual revenue of over $50 million, and that have been looking online for relevant IT consulting services. In comparison to traditional marketing, digital marketing often produces a higher return on their marketing investment. Digital marketing can reach and convert new customers efficiently and much quickly than traditional methods. For example, a digital marketing campaign can target prospective consumers on social media platforms like Facebook, LinkedIn, Pinterest, and Twitter by paying only for an ad when the prospect clicks through to the website to learn more. Through email marketing and blogging, companies are able to retarget and engage with their consumers on a regular basis. It also helps customers looking for your products and services online to you rather than the other way around. While both digital, as well as traditional marketing, is awesome, there are a few things to consider with digital marketing. Most of us today have a Facebook account and use the internet throughout the day but still cannot be called digital experts. Digital marketing done right takes training, experience, and keeping up with trends as its rules of the game keep changing frequently. It requires marketers to be aware of their target customer. If they are hoping to reach older generations, Twitter may not be their best bet. You might consider Facebook or LinkedIn better marketing methods for this audience. Traditional marketing typically follows a more manual process with more time and more money. Digital marketing, on the other hand, is highly automated and efficient process that uses technology. Technology and software take data and pull it into a user-friendly database. By doing so, digital marketing provides real-time tracking of what works and what does not work so that marketers can optimize your efforts. For marketers who are trying out a new ad idea, the digital route allows to immediately gauge its success. If it underperforms, they can change it without wasting money. Traditional marketing needs a longer period of time to test. Marketers have to wait to test their strategy, and it may end up spending money on unsuccessful materials. Therefore, is a company's marketing strategy does not include these channels, they must start considering them. Traditional marketing methods like television and magazine ads can be costly, especially for small businesses. It's wise for companies to build a marketing plan by selecting the most efficient channels for their business first and then laying on additional channels as the size and scope of their business increases. In many ways, the lower costs of digital marketing create a more level playing field, allowing smaller businesses to compete with larger ones. As mentioned earlier, digital marketing has an advantage over traditional advertising in terms of targeting the right customer segment. Digital marketing allows for campaigns to be hyper-targeted according to the gender, age, interests, location, and even past purchasing behaviour of the target customer. This allows companies to get their message in front of the right consumers. Digital Marketing has the benefit of graphics and graphic designing can make a huge difference when it comes to targeting the right customers. A good design is the mainstay support of being digital. Companies these days utilize graphic design services in the best way possible promoting their company objective and establishing brand recognition. Consider platforms like Google and Facebook AdWords. They can show ads for a company's products and services that align almost perfectly with what those customers are searching for. In case a company is selling shoes, Google and Facebook ads can target people looking for shoes just like the ones they offer. Digital marketing offers a great opportunity for interaction with customers. Typically when it comes to traditional marketing, marketers have basic demographic information like age, race, gender... and that's it. For example, if they are running a newspaper ad, they may only provide general demographic information for their subscribers. For marketers to find out how people are finding them or what they think of their ad, digital marketing is key. This is where digital marketing has great power and why traditional marketing might completely get diminished in the upcoming years.